Holomisa is an informal settlement located in Katlehong (Ekurhuleni, Gauteng). 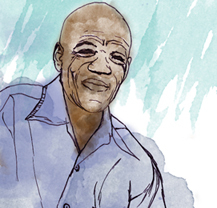 In May 2014, Pumelele Ntanjana, one of the leaders of Holomisa Informal Settlement, contacted the Informal Settlement Network (ISN) to request support for a possible re-location of a portion of his settlement. Today, Holomisa has been profiled and enumerated, new taps have been installed and it has become a learning centre for other ISN communities in Gauteng. The Holomisa story tracks back to an ISN leadership meeting that took place in Germiston (Ekurhuleni, Gauteng) in 2008. In that meeting, leaders from all informal settlements in the area had been invited to attend, Holomisa amongst them. When Holomisa leadership were told by their councillor that a portion of the settlement needed to be re-located because of the enlargement of a neighbouring school, they approached ISN for support. ISN was invited to visit the settlement, where they firstly met with Holomisa leadership and the ward committee members. 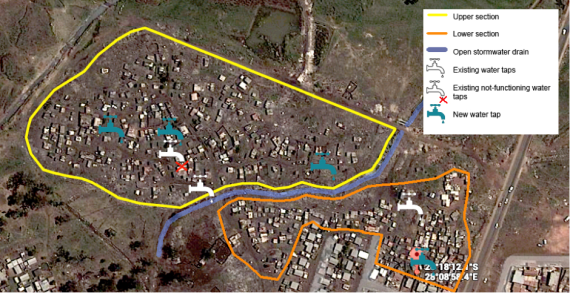 The community and ISN profiled the settlement in May 2014 and identified a need for more sources of water (only 2 functioning taps for about 500 households). This was confirmed in a public meeting, where residents requested support for an immediate improvement of their daily lives through implementing more taps, improving sanitation conditions and electrifying the settlement. The settlement’s improved service delivery would also be an additional step to ensuring land tenure. Finally, the savings team organised community savings to save 10% of the budget for the project. The outstanding 90% of the budget was financed by the Community Upgrading Finance Facility (CUFF) housed in uTshani Fund. 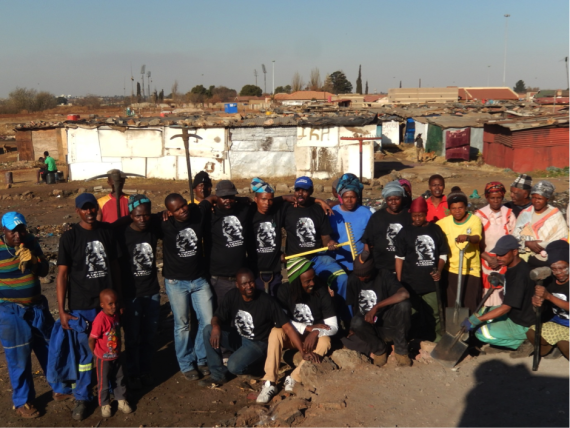 Mandela Day (18 July 2014) was finally the day for the project to start. In the space of 6 days, one tap was fixed and three more taps were installed. 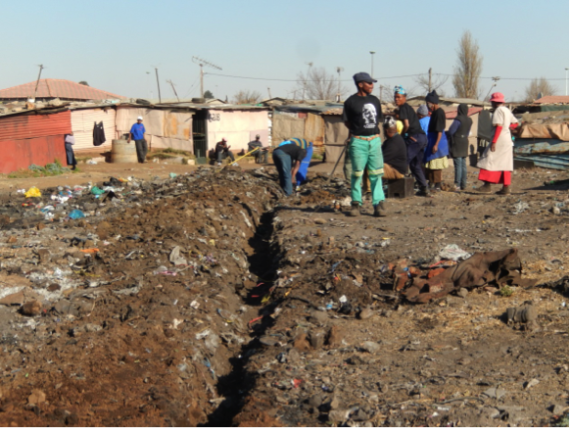 25 local residents volunteered for the project, a technical team of 10 ISN members was on site and 6 leaders from neighbouring informal settlements were invited to participate and learn in the process, thus increasing their skills and building capacity. 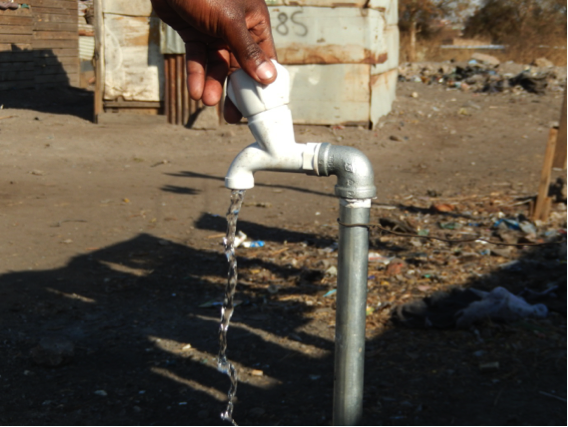 The project was a success for the communities involved, not only because the installation of more taps improved the living conditions of Holomisa residents, but also because some valuable lessons were learnt. Firstly, the will of the people has been proved to be the best tool to work with. The residents identified the need for more taps and lead the project from the first day. Secondly, the power of residents taking ownership of the project. Residents did not wait for external people and institutions for their permissions or to come to the work, they pushed for their needs to be heard and did it themselves. Finally, the learning centre has proved to be a success. 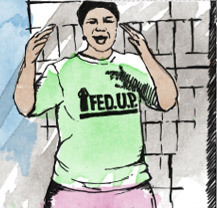 6 leaders from other informal settlements were capacitated using almost the same amount of resources. However Holomisa’s story does not end here and the process is still on-going. Holomisa residents, are in discussion with their Ward Councillor for the re-location process of a section of the settlement. Continuous engagement with the ISN will ensure that the re-located residents will be allocated a new portion of land, which it is still to be identified.